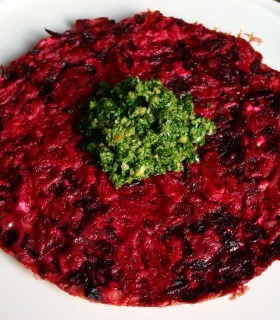 If you want a really healthy yet mega-tasty vegetarian meal, try my beetroot frittata with pesto. I love beetroots (beets) and I make an effort to include a lot of super-healthy raw green leafy vegetables - such as spinach and watercress - in my diet. When it comes to pesto, I do personally prefer to make it with rocket (arugula) or watercress together with a bit of spinach or parsley, rather than with just basil. I think it gives the pesto more oomph! I am using raw beetroots in my beetroot frittata but you can use cooked beetroots in natural juices (preferably organic ones) if you only have those at hand. 1. Start by making the pesto. Place the rocket/watercress, spinach, walnuts and oil in a food processor and pulse for about 10 -15 seconds. Add the crushed garlic (if using) and grated Parmesan cheese to the mixture. Season with a pinch of salt and some black pepper. 2. Crack the eggs into a bowl and beat well. Add the grated beetroot and crumbled feta cheese and season with just a pinch of salt –as the feta cheese is quite salty - and more liberally with black pepper. 3. Heat 1 tablespoon of olive oil in a medium-sized frying pan over a moderate heat. Add the beetroot mixture to the pan and cook for 2-3 minutes, until the mixture starts to set. Place a large dinner plate on top of the frying pan, invert, and slide the frittata back into the pan. Continue to cook for another couple of minutes. Serve the frittata with a dollop of the pesto on top and a side salad.